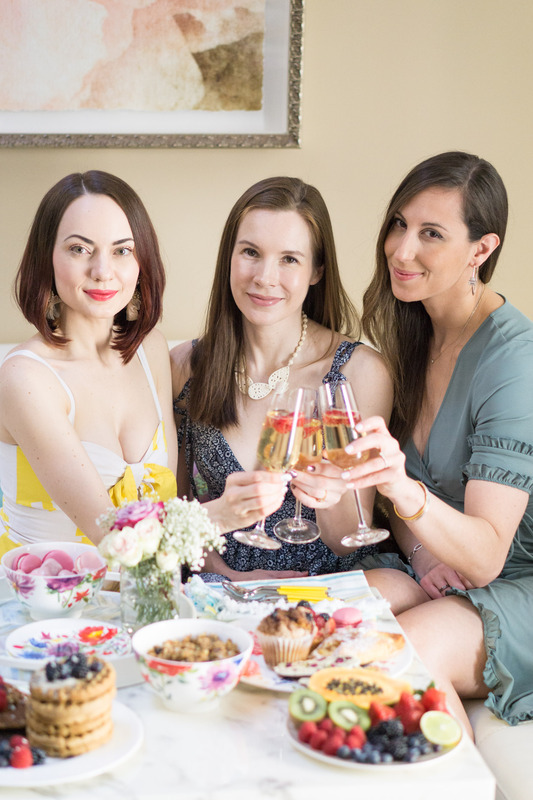 A few weeks ago, two of my besties, Alissa and SJ, came over to my house for desserts, drinks, and the ultimate girls get together. I had a few additions to my living room, a new coffee table, an art piece (you might have seen it already), and a beautiful set of dishes from Villeroy & Boch. I knew both lovely ladies for a few years now, SJ is a fellow blogger who (as it turned out!) always lived just a block away from me. And you already know Alissa, as we both started out on social doing a weekly Periscope live shows. 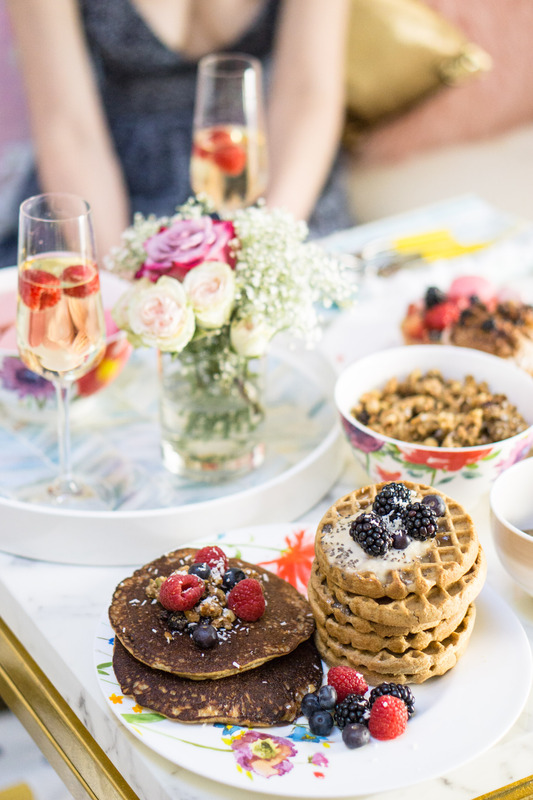 I was thinking that you might be interested in learning about all the planning that went into this casual gathering so today I’ll be sharing my tips on how to set up a perfect brunch table. 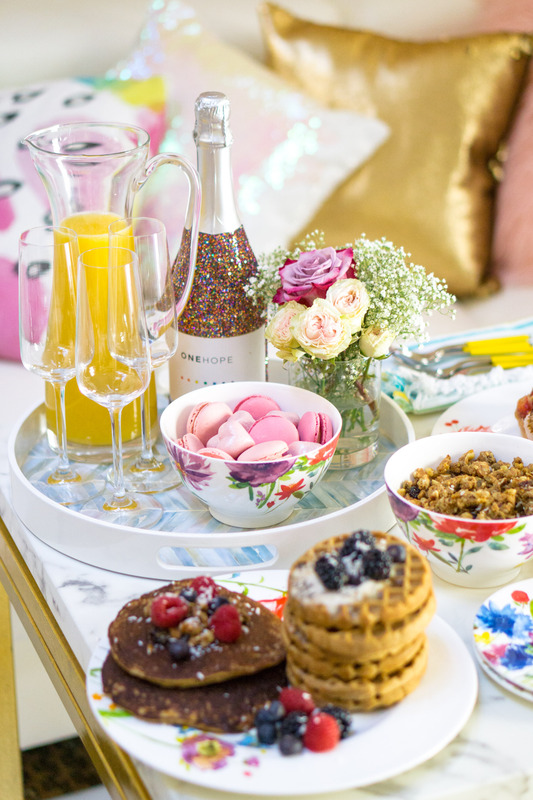 Before we begin, let me emphasize that these tips are for a small, intimate brunch that does not require place settings or a brinks buffet that you are so used to seeing at home décor magazines. Instead, these are very doable and easy to implement strategies that you could use with things that you already have in your table décor collection, plus a few inspirational pieces that you might want to get for that type of occasions. Please make sure to check out the end of this post for some shopping recommendations! 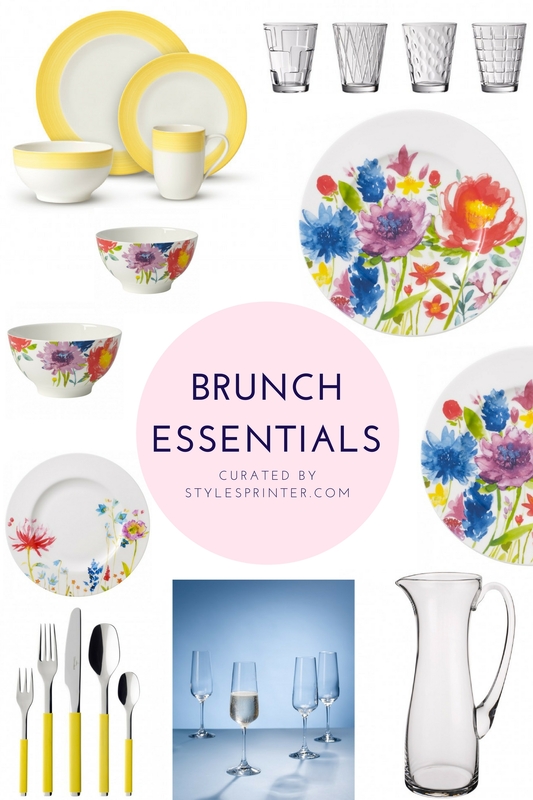 First and foremost, decide on the color theme for your brunch table set-up. I know, it sounds like a generic advice, but it’s crucial to decide on what matches and what doesn’t if you want to create a cohesive table set-up. I recommend picking two main colors and add up to three complimentary shades. 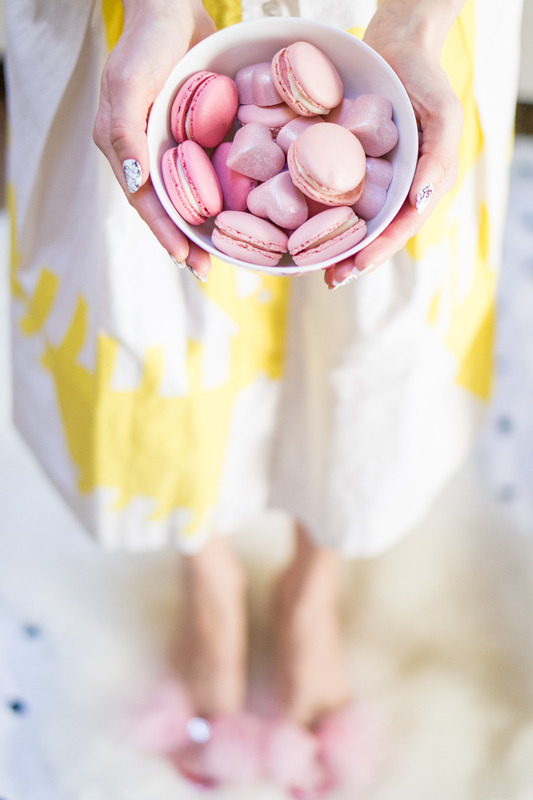 For my brunch party, I picked yellow and red as main colors and supplemented them with shades of white and blue. This decision was inspired by Villeroy & Boch Anmut Flowers Collection. I really loved bold, vibrant floral prints that look so springy and memorable. I used the color hue of this collection as a starting point for planning the table set-up. I also wanted to update my utensils collection and figured that since my dinnerware set has yellow accents, it will be a perfect match for the S+ Sun Flatware Set. From there, I added a napkin set and a tray that incorporate complimentary shades of blue and white—these four staple pieces defined the main color theme of my table set-up. For the longest time, we only had one set of utensils for the house, so when a special occasion came my table set-up didn’t feel quite festive. Also, over the years, a few spoons and forks got lost so I was so ready for the upgrade. So, when I found this vibrant flatware set by Villeroy & Boch, I was hooked. 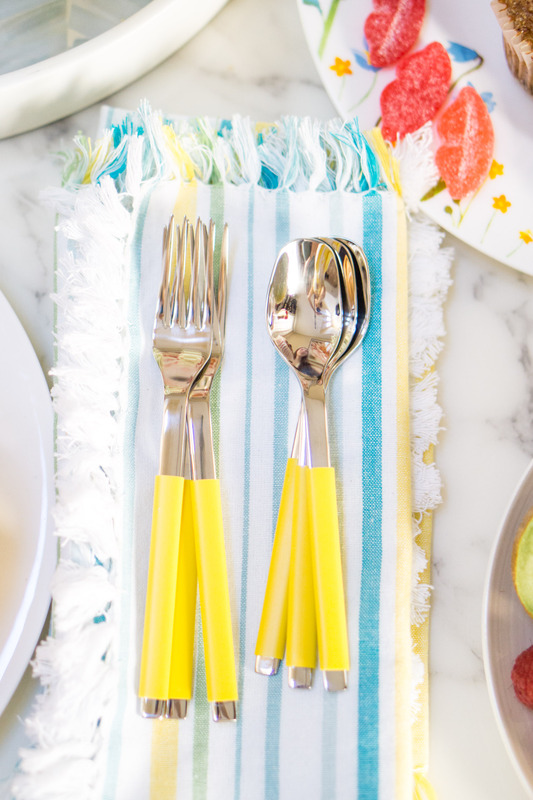 At the end of the day, you can make your table pop by adding a few décor pieces and picking colorful dishes, but nothing brings it to life as good as a cute utensil set. If you are ready for the utensils upgrade too, I highly recommend picking something out of your comfort zone in terms of color and finish. While a classic silver finish set might sound like a great versatile option, if you are specifically looking for a special occasion utensils upgrade, a bit more colorful option might elevate the table just a tiny bit more. Before I moved to New York, I couldn’t understand what every house party I went to had a mandatory drink tray set-up. Back in Russia, where I’m originally from, trays were never such a big trend and I didn’t feel the need to have one. Now, when I can finally call myself a New Yorker, I’m the biggest fan of setting up a beautiful tray to decorate the table. In fact, I think it’s one of the quickest and elegant ways to add dimension to your table set-up. Think about your table layout in terms of height of all the pieces involved. If you use only flat pieces like plates, napkins, and utensils, your table will lack diversity and thus look plain. 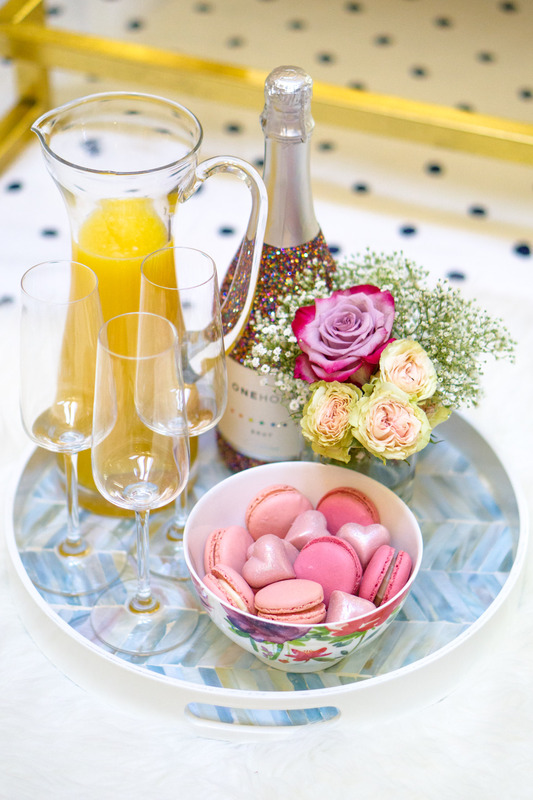 That’s why it’s important to introduce different height pieces like a juice pitcher and champagne flutes. Not only it’s convenient to have all of your glassware in one place, with this set-up strategy your table will look multi-dimensional and organized. While a set of flat plates is crucial for any table set-up, don’t forget about bowls. 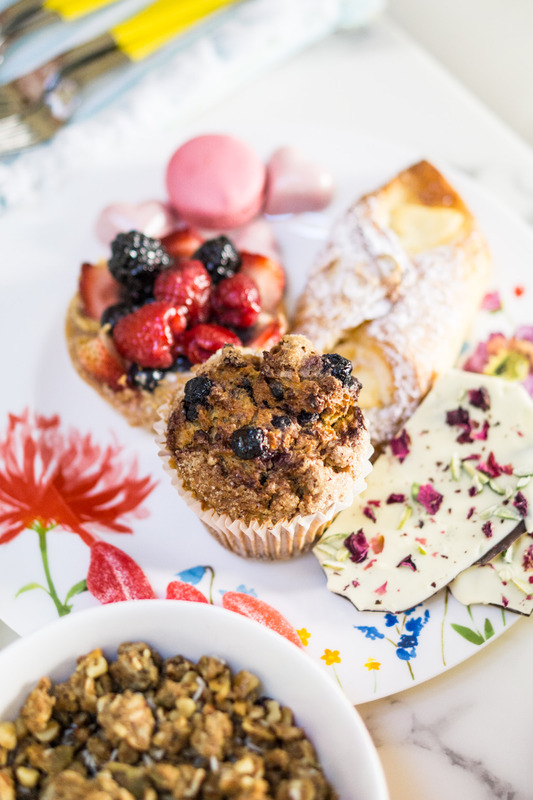 Regardless what type of party you are planning, it’s handy to have deeper plates where you can serve “messier” dishes like granola or fragile baked goods like macaroons. 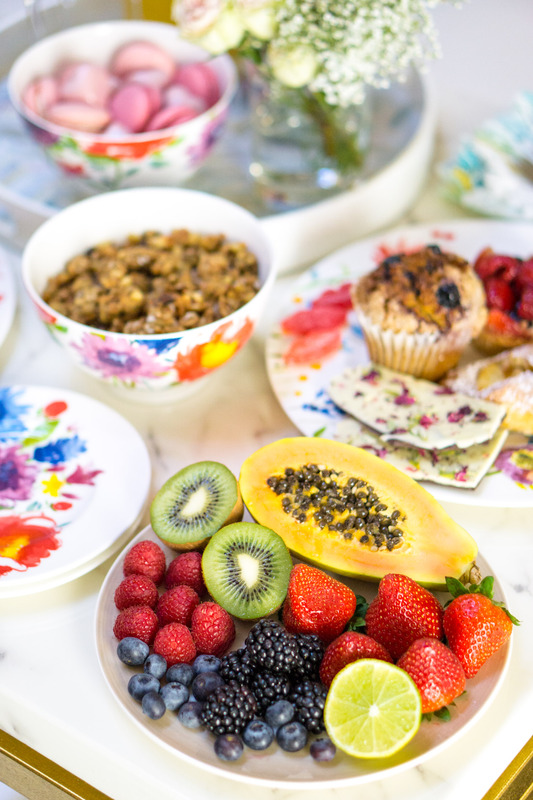 Even though I already have a few everyday bowls in my dishware collection, I wanted to have a few matching bowls from Villeroy & Boch Anmut Flowers Collection. I loved the idea of having matching display plates for all the desserts I had for my girls. 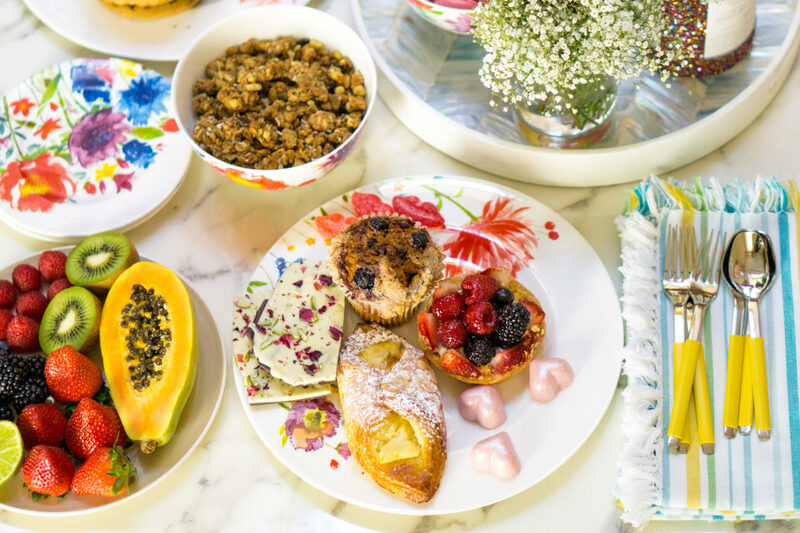 Also, I personally can’t imagine a brunch without a bowl of organic, gluten-free granola so I had a plate of granola ready to pair with fruits. 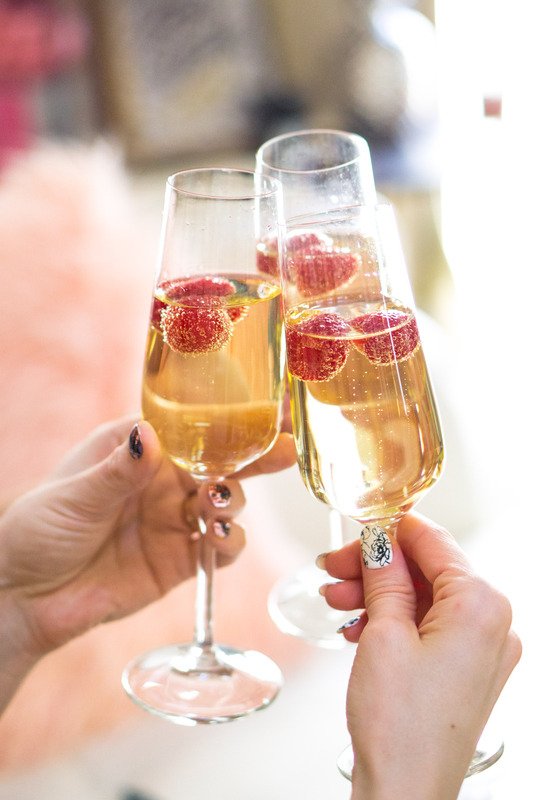 I already wrote on the blog about all the ways how you can make your glass of bubbly a bit more special. 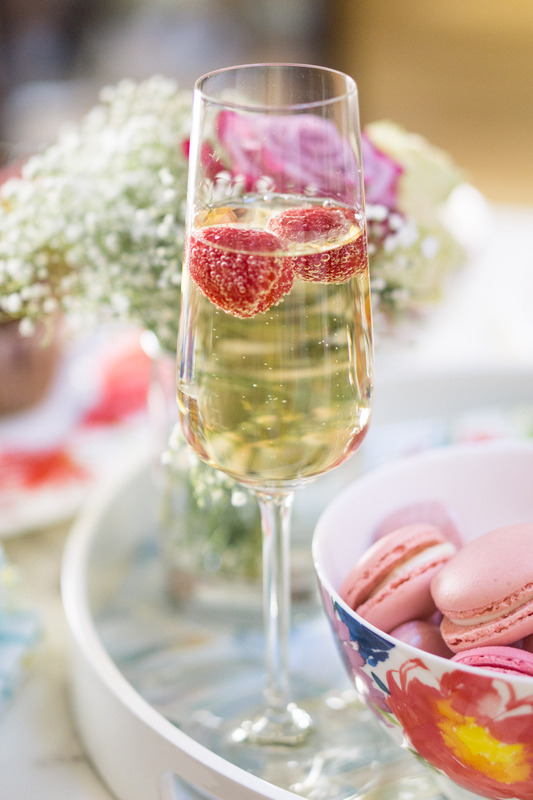 Whether you decide to add a sugar stick or drop a few berries, a champagne “upgrade” will make it feel so much more special! A beautiful glassware helps too! 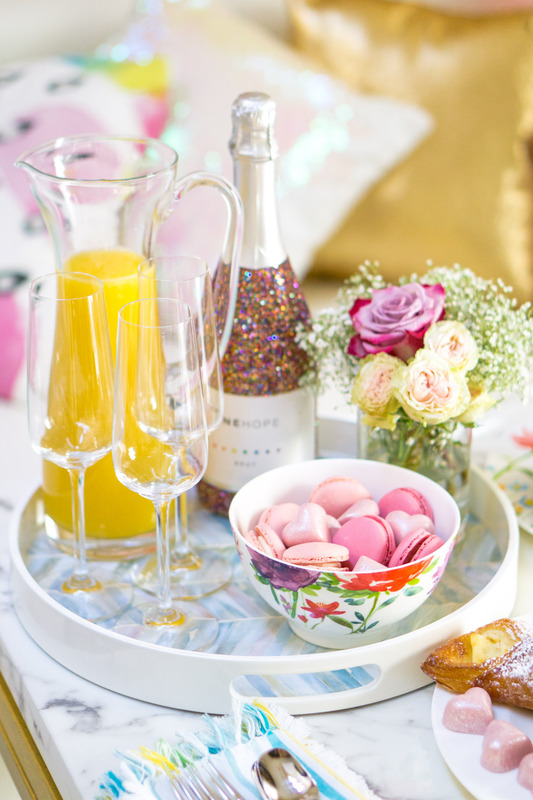 I love how elegant these new champagne flutes look on the table, whether you are drinking champagne or a Mimosa. 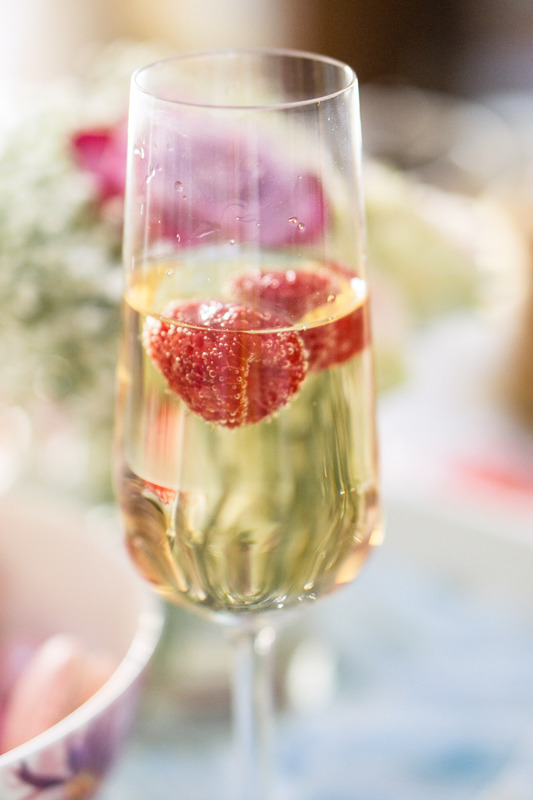 A champagne bottle could also work as a beautiful centerpiece. Take, for instance, this glitter champagne bottle—even though it’s not the exact match for the selected color theme, I love how it adds a pop of sparkle to the table set-up. It definitely stands out when placed on the tray and looks so cute in photos. Honestly, I’m not the best when it comes to decorating the table, but over time I learned a few tips and tricks that always seem to work. These do not entail too much effort and could be done in literally under 10 minutes. The effect though is pretty impressive. They say, that beauty is in details and I’m excited to share with you a few ideas on how to make your table look even more beautiful without spending too much time on it. I’m probably biased because I love fruit so much, but in my opinion, there is nothing more colorful and pretty to look at than a colorful fruit plate. Luckily for me, fruit plates take literally no time to prepare and there are no set-up rules: you can pick whichever fruits you have and arrange them as you wish. 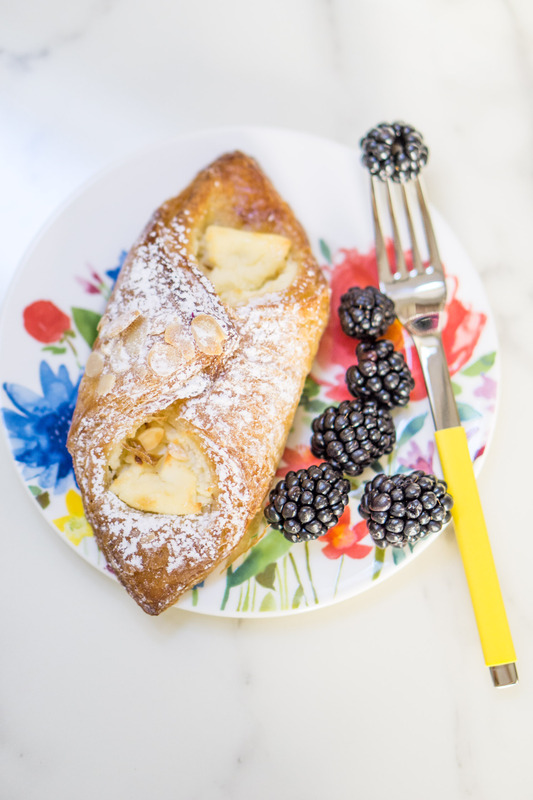 Fruits and berries are also great for decorating takeout food. 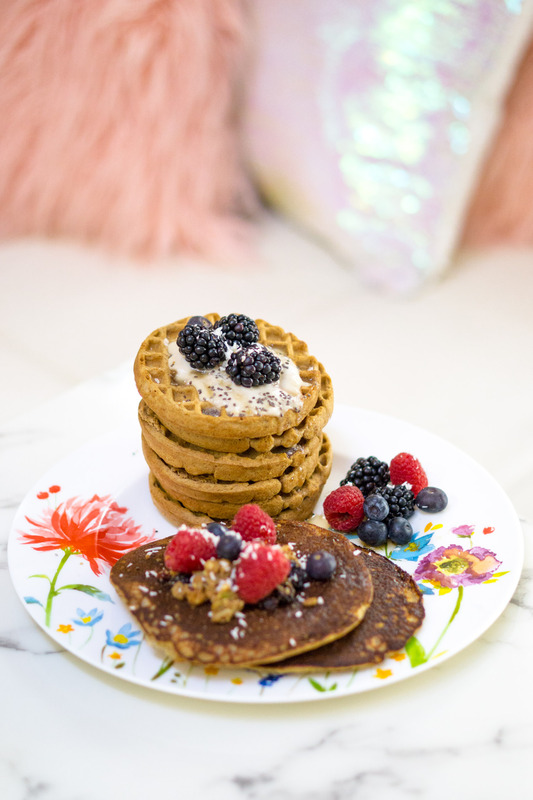 For instance, we ordered these paleo pancakes from my favorite gluten-free café Hu Kitchen. 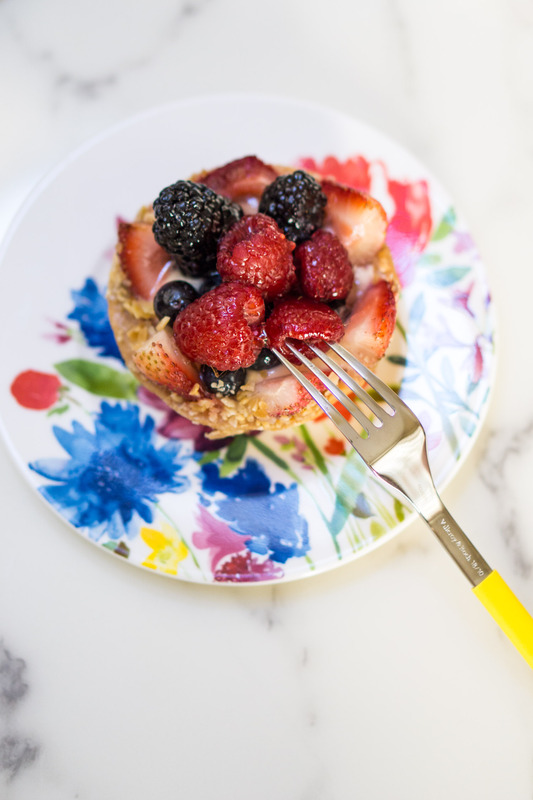 I added just a few spoons of granola and some berries to make them look even more delicious. Don’t be surprised by the number of pillows you see in these photos. I imagined this get together as a cozy and relaxed gathering, so I picked all of my favorite pillows to create a cozy cocoon in my living room. My girls immediately noticed how much more comfortable it was sitting that way. We took these photos a few days after Alissa’s wedding where I DIYed bouquet and this centerpiece was created from the leftovers of flowers that I got for her. I love the idea of having a minimalistic floral arrangement as it doesn’t overpower the food from the perspective of looks and the scent. Finally, I wanted to play with my favorite shades of blush and rose pink so I decided to set-up a bowl that incorporates desserts of these shades. 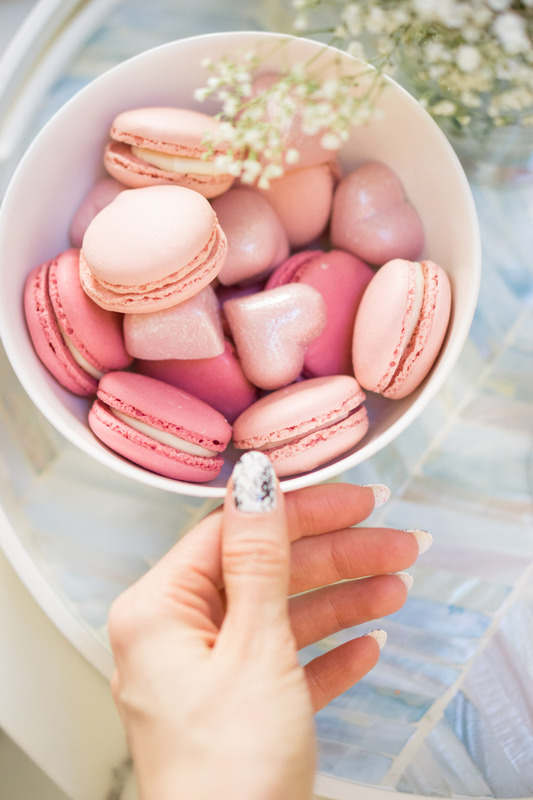 I picked macaroons at the local bakery and found pink hearts chocolates at the local gourmet market—and there you have it a chic 5-minute dessert plate! 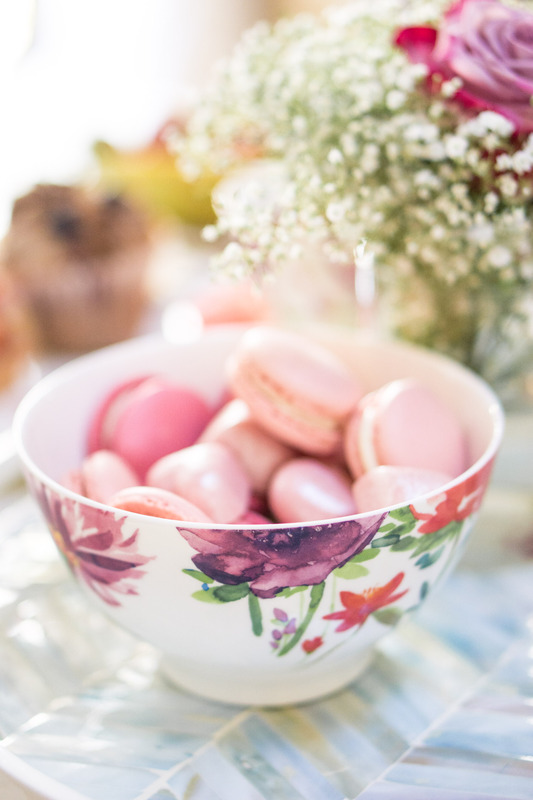 Where to Shop for Pretty Table Décor? 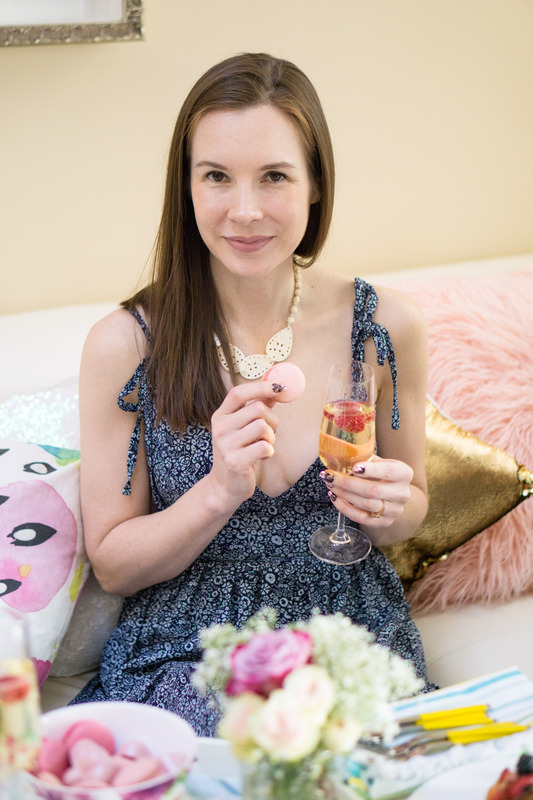 You are probably dying to learn where I picked each and every décor piece for the occasion and I have to admit that the majority of the items you see are from Villeroy & Boch. These timeless and standout pieces that I describe below are available at Macy’s, Bloomingdale’s, or brand’s website. 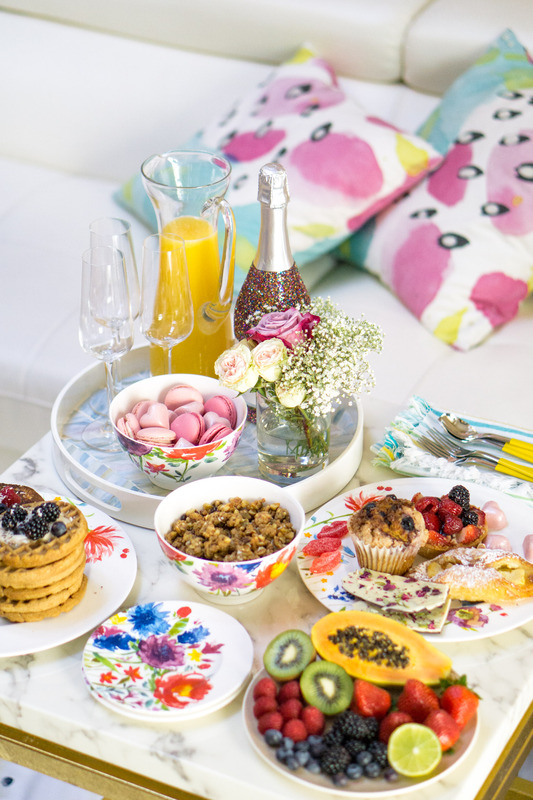 There you have it: 10 tips on how to set up a pretty table for your next spring brunch. 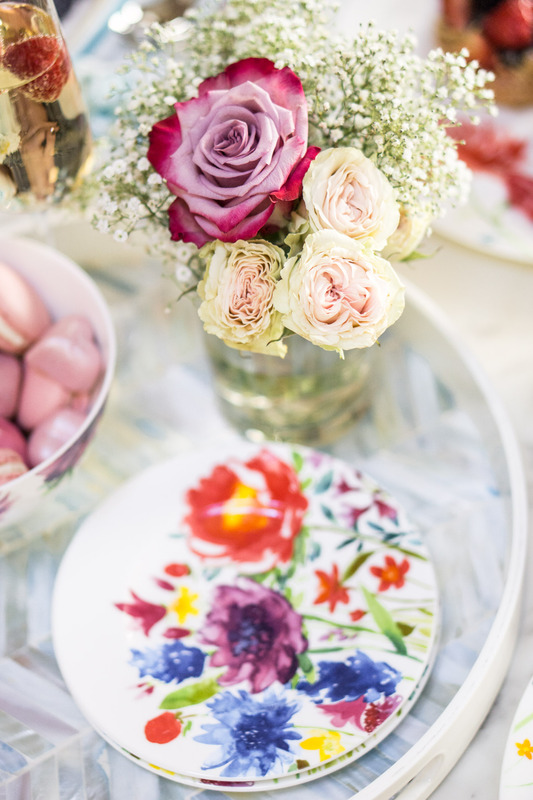 I know that a lot of people are celebrating Easter or Passover this weekend so I hope you found some of my table décor and entertaining tips helpful. On that note, I look forward to hearing some of your favorite table décor tips and tricks—please share them in the comments. This post is brought to you by Villeroy & Boch. Previous Post Why Bloggers Attend Auto Shows?